FORT PIERCE, Florida – They may not be on Facebook or Twitter, but dolphins do, in fact, form highly complex and dynamic networks of friends, according to a recent study by scientists at Harbor Branch Oceanographic Institute (HBOI) at Florida Atlantic University. Dolphins are known for being highly social animals, and a team of researchers at HBOI took a closer look at the interactions between bottlenose dolphins in the Indian River Lagoon on Florida's east coast and discovered how they mingle and with whom they spend their time. 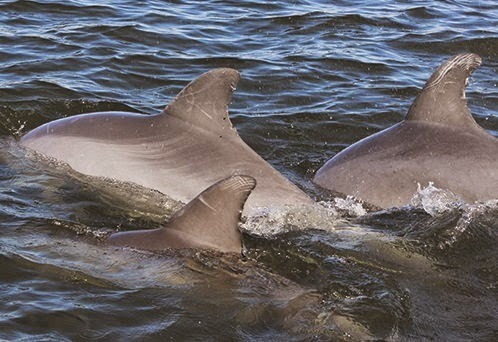 Through intensive photo-ID surveys conducted along the Indian River Lagoon, which were carried out over a six- and-a-half year period, the researchers were able to learn about the association patterns as well as movement behavior and habitat preferences of some 200 individual dolphins. In a paper recently published in the journal Marine Mammal Science, the team found that individual dolphins exhibited both preference and avoidance behavior – so just like humans, they have dolphins they like and associate with and ones they avoid. The study also found that Indian River Lagoon dolphins clustered into groups of associated animals, or “communities,” that tended to occupy discrete core areas along the north-south axis of the lagoon system.